Here is an amazing looking Chrysiptera talboti, commonly known as the Talbot damselfish. Found in the Western Pacific and the East of Indian Ocean, mostly around coral reefs. Spotted at the depth range of 5- 35 m and to a size of 2.4 Inches. This is a reef-associated fish and has some very bright colors of yellow and light pinkish. Face yellow and body light pinkish has a black patch towards the dorsal fin. Semi-Aggressive, beautiful and is a great addition for reef tanks. Easy to keep, a bit shy in the beginning but swims aggressively later. Mine would eat everything I threw in the tank from flakes to pellets. Most I am using Prime Reef Flakes from Ocean Nutrition and Hikari’s Marine S.
Requires hiding spots and later becomes territorial once matures in the tank. This fish when comes to retailers in India it is referred as the fish which has been imported from Indonesia. Finally, we get some variation from the regular blue and yellow damselfish. I kept this fish thinking it will pair up with my clowns but eventually it did not and end up harassing my clowns. So, had to put it with little more aggressive tank mates. Grate addition, brilliant colors if you are looking for some change and variation in the damselfish Talbot’s damselfish is for you. 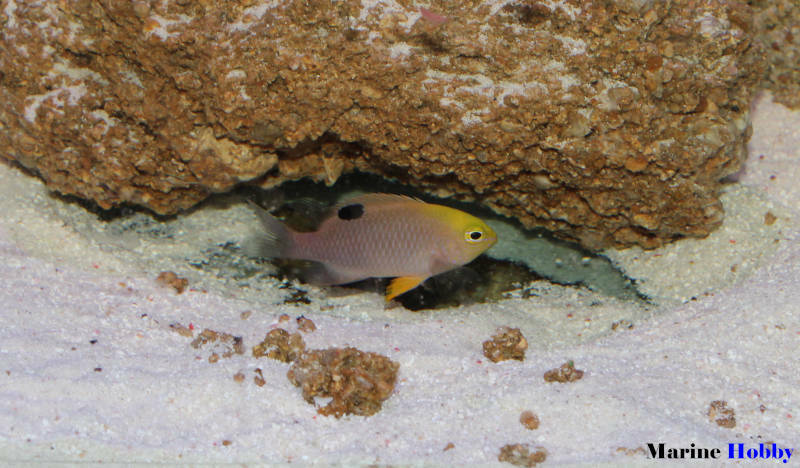 Lastly, this fish like other damsels is not easy to catch if you have a lot of rock work in your tank. So, looking for more on this fish here is FishBase.